Etna is an alive creature, dynamic, majestic and irascible, with which the brontese folks, are used to live with, and to love. The history of Bronte has been forever bound to the one of the volcano that has allowed the town to extend, in some epochs, and has reduce it to more modest proportions in other periods, without, however, destroying it altogether. Its impressing mass, that tower majestically over the habitat, reminds us that we are in front of the biggest active Volcano in Europe and one of the major of the entire planet. It is, in fact, an enormous and isolated mountain, delimited by the rivers Simeto and Alcantara; a mountain that, with its majestic height, dominates half Sicily and offers a spectacle of grandeur, black of petrified lava, white with snow over the top, green with woods along the slopes. Rises over a basement of sediment rocks of 1.570 square Km, has a height of 3.350 meters, a circumference of about 250 Km., and a diameter of 44 Km. The Sicilians call it, also Mongibello (union of Latin word "mons" and the Arab "gibel", that is "mount of mounts"). 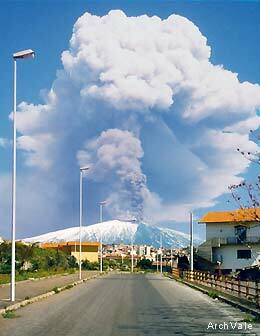 According to experts, notwithstanding its continuous eruptions, among the Italian volcanoes is the least dangerous. 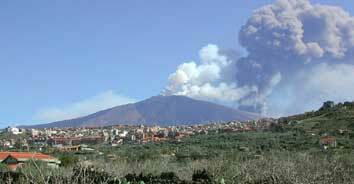 Its height, in the last fifty years, has increased, because of its eruptive activity, of about 60 meters. From Bronte it offers its most majestic image, moves, rumbles, gets angry, erupting rivers of lava, and every time that happens its height varies, changes. From its craters comes out hurling ash, lapilli, vapor globes that reach incredible heights (columns over 10.000 meters high and widths of over one hundred kilometers). Never the less an articulated and profound rapport ties Bronte's inhabitants and Etna ("a munta­gna", as it is called here). More love and veneration than hatred, more religious respect than aversion. Instead of running away, the local peasants have resisted, and continued to cultivate along the slo­pes the orchards, the vineyard, the pistachio plants and all those fruits that the land fertilized by the volcanic ashes, has always made peculiar in their quality. In the silent struggle between the man and "a muntagna" often the volcano's fury has devastated the territory of Bronte and, in the past, also the wretched settlements of our ancestors, erasing for ever from history the first traces of civil organization of our people. The Bronte's territory had to put up with all the vicissitudes that come with the being a volcano to which, in the centuries, has been identified with in humors and destinies. Of these destinies, often of destruction, is impregnated its centuries old history and its economy. 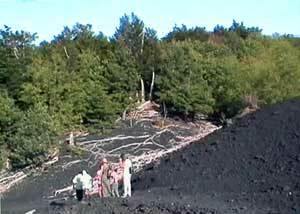 In the picture on the right, the lava flow has reached a wood at the feet of 'Etna destroying it partially. Many centuries have to go by before some grass shall be seen again on the lava. 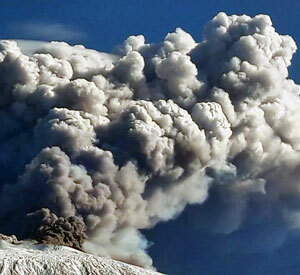 A spectacular eruptive activity of Etna. that during the last millennium have destroyed part of the cultivable territory of Bronte and very many hectares of woods. Benedetto Radice in his Memorie storiche di Bronte remembers particularly the lava flows of Na­va, passo Zingaro (1395) and those of 1170, 1536, 1651, 1758, 1763, 1832 and 1843.
very close to the Simeto river. 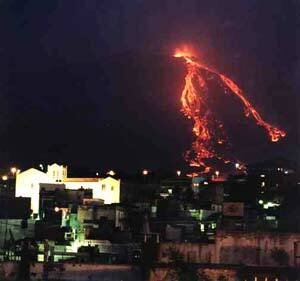 An other lava's arm, going over San Vito, arrived to he mount Barca. Many people from Bronte emi­grated but the majority came back to rebuild their houses over the extinct lava. 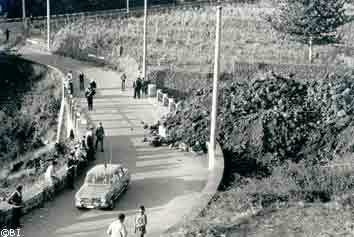 The lava is covering a bridge in a small provincial road at the feet of Etna. 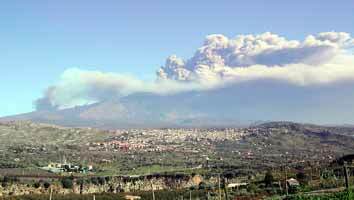 The impressive mass of Etna raises with its height of 3.350 meters at the back of Bronte. The basement of the volcano has a diameter of about 44 kilometers.